I have been compiling this guide over the last weeks to put together all essential elements in my belief that one might need to (re-) start their personal development experience. 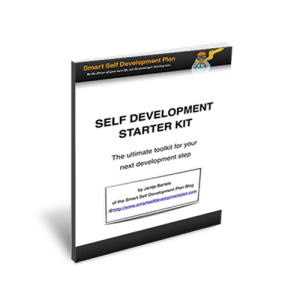 As of today, it is available for all subscribers to the Smart Self Development Plan Blog. This 20-page guide contains comprehensive information and it has been written for curious people. People who might have done some type of a self development training, or not at all. People who have taken the initiative in the past to work on their personal development goals, and now would like get back into it. Either or, the guide is a great information kit to support your next development steps. What’s inside (a part from the citation above, I mean)? It uncovers the benefits of Personal Development. It provides guidance for the first common essential step of all Personal Development initiatives. It shows you what you cannot expect to happen. It provides plenty of resources to start building you personal road map. It is equipped with easy & short exercises. It prepares you for your next development step with helpful advices from many participants. How do you get access to this Self Development Starter Kit? The answer is simple, just sign up below by entering your email address or simply click here. Once you subscribed, you will get a link to download the guide and you will also receive further personal development tips and tricks on a weekly basis. I won’t let this opportunity to receive information about personal development pass me by. I already enjoy reading this post. I look forward to the next. Miraflor Rayla recently posted…Why SMART Disability Living? Thanks, Miraflor. I hope you will enjoy!